In the process of study, the class discovered at least three misleading claims in the book Are We Really Better Together? 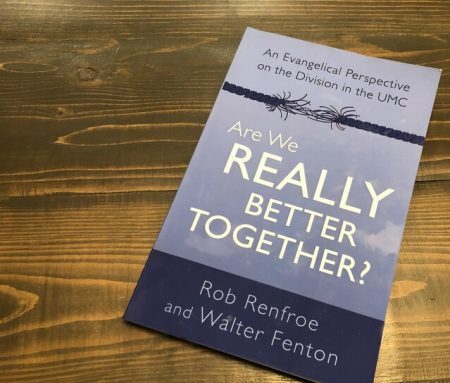 An Evangelical Perspective on the Division in the UMC by Revs. Rob Renfroe (Good News Movement President) and Walter Fenton (Former Good News Movement staff, now staff with the Wesleyan Covenant Association), both writing from The Woodlands, Texas. I claim them below as my own, though not all were initially been detailed by me. Incidentally, when the ACNA broke from The Episcopal Church over their change in ordination standard to consecrate a gay Bishop and allow partnered clergy, they ceased the ordination of women in some regions, and the election of female bishops across the board, the latter of which is still practiced. Similarly, if the WCA breaks from The United Methodist Church, removal of the ordination of women is the only thing left to put them back to be in-line with the Christian traditions that Renfroe/Fenton admire. Hi Chris, I agree their claim was not directly about women’s ordination. But their claim was that if we changed our ordination standards with regard to LGBTQ persons, then we would be outside of those historic traditions. I was naming that we already are outside those traditions, so there’s little ground lost or mutual efforts sabotaged. Thanks for your comment and engagement! It’s true that most Christians are part of denominations that do not ordain women. But the vast majority of those in the following of Wesley belong to groups who do: the UMC, Wesleyan Church, Free Methodists, Nazarenes, a HUGE swath of Pentecostals, etc. Ironically, the UMC and most of its predecessor bodies were rather late in getting on board–early adopters were the Wesleyan-Holiness folks (tossed from the UM predecessor bodies for their opposition to slavery and worldliness) who are now considered very conservative by most UMs. Personally, I don’t know ANYONE affiliated with any of the UM renewal groups who’s advocating for rescinding the ordination of women; if there’s no evidence of it then it shouldn’t be used as a scare tactic. They didn’t advocate for removal of female bishops in the ACNA until they were constituted either as separate from TEC. And the way how renewal groups work, they always need a scapegoat. So I’m concerned for women or some other minority group (moderate evangelicals?) who would be next on the butcher block after The Gays are out. John commented on “the vast majority of those in the following of Wesley.” Your response, Jeremy, about the ACNA was thus, off-topic & argumentative. If you want your blog to be given serious consideration, at least do the same for your commenters. Just so I understand correctly, you don’t know of anyone in the UM renewal groups who’s advocating for restricting women’s ordination, but because the ACNA did so you’re convinced that the WCA/Good News/Confessing supporters will suddenly undertake a policy that creates even greater distinction from our already-more-conservative Wesleyan-Holiness and Pentecostal brothers and sisters, making far more difficult any potential union with one or more of those bodies. Correct. Rights are intersectional. A denial of rights to one people group makes it easier to deny them to another. Or it simply shifts the denial. We see in the past decade how easily women’s rights in secular society have backpedaled. And how many conservative white men charge at being “monitored” by GCOSROW. If you cannot trust women to make decisions over their bodies, it’s only one more step to denial of their decisions over the body of Christ. We are all in this together. My affection and care for evangelical anti-gay women still don’t want them to be part of a denomination that backtracks on their support of them. Got it. There’s nobody within the UMC we can positively identify as wanting to roll back women’s ordination, but based on conjecture about the motivations of unknown others there must exist entire groups who want to do so. Then, because we “know” those groups must be sinister, we can foresee their plans. Silly John. You think anyone would write this in public? The ACNA ban wasn’t spoken of beforehand either. Let’s chat in a year and see which denomination has furthered the rights of women and which hasn’t. I’ll email you. Jeremy, thanks for your post of the inaccurate statements of the folks looking to destroy the UMC. If they really think the UMC is not worth maintaining then why are they so insistent on making our church so restrictive as to hurt and bully so many of our leaders striving to connect with our changing world? I really wish the WCA and Good News folks would simply leave. They are staining the open hearts brand of our denomination. Interesting view. From where I sit it is the Progressives who are destroying The UMC. WCA is trying to save our denomination from internal corruption. Jeremy, you really pick some minor points to find fault over. Carefully crafted in added from the floor. That means people can’t be careful and decisive. On human sexuality the one church plan is out of the mainstream of both Wesleyan and most other denominations. The part about women is a straw man argument, trying to create fear among women, which is what progressives always rely on when the can’t win a point on reason. The Bible clearly points to the ability and equality of women, starting with Deborah in Judges. People who rely on Paul’s message to a church where he uses the phrase “I don’t allow” instead of “God does not allow” are misreading the intention of God and even Paul. He was dealing with disorder in a single church. His goal was to turn pagans into Christians. He could not fight every battle and that one was the most important. Still is today. By the way I noticed that when you listed the percentage of votes you always put 52 to 48 second, even though more recent votes have been towards are greater percentage to maintain the discipline. Society may be swaying but the laity are not. Nor is the African church which will soon be the majority of the UM church. I have known MANY Gay persons of African descent. There is a growing LGBTQ Civil rights movement in Africa. Many of these activists from Africa have contacted me on Facebook. Anti LGBTQ feelings in Africa are a legacy of Western imperialism. I find it a bit hypocritical for a Progressive to take issue with the specific language of a WCA book. Perhaps your time would be better spent reading the specific language of the Bible or reading the BOD which you swore an oath to uphold? I am not aware of any bullying of UMC leaders. I am aware of UMC members trying to hold their leaders accountable to the BOD which they swore to uphold. If those leaders refuse to abide by the BOD, then they need to step aside as they lose all credibility. That is not bullying. As I stated, that is simply holding people accountable. Remember, our leaders work for us,not the other way around. Also, our leaders should not be “striving to connect with our changing world”. The world constantly changes and our leaders should NOT be trying to chase its secular issues. Our leaders need to focus on Biblical issues, not secular ones. Any UMC leader who is trying to connect us with our changing world is not someone deserving to be in a UMC leadership role as they have their priorities askew. Thanks Jeremy for your insightful article. At one period of time in our history, slavery was viewed as an historical position and tradition. We do grow. Please help me to understand all of this. Some are telling me individual churches can opt out of the Progressive position. But would not the Church it self The United Methodist Church still be known as a body who will not uphold traditional marriage and will have gays in the pulpit. I am a lay person and I am torn apart…grieving for my church and the fellowship I must leave. Are there any words of comfort? I assume all of the above authors are clergy. You all know the inside of this but we, regular members, are kept in the dark. It helps to write all of this. I hope someone replies. Like you, I am also a lay person. I am sure there are others on here who can provide the details better than I. I will try and give you the Reader’s Digest version. The UMC Commission on Way Forward, appointed by the UMC Bishops, came up with three plans, the One Plan, the Connectional Plan, and the Traditionalist Plan. The Commission voted to recommend the One Plan. I will let you google and research these rather than try and describe them here. These three plans, along with some others, will be presented to the 2019 General Conference to be held in St. Louis in February next year. These plans will be discussed and most probably their language changed some, amendments added, etc. All this to say that the plan or plans which come out of GC19 will most probably look and read different than they do now. Thus, I would encourage you to wait until after GC19 before making any decisions about leaving or staying in the UMC until the final plan comes out of GC19.